Trim Tabs make your boat ride smoother, drier & faster. They also increase safety by improving forward visibility and keeping the boat more stable. Trim tabs make the single biggest difference to the way your boat rides and performs. Offered only as an option on many new boats, their benefits are so significant they should be standard on virtually all power boats. The Boat Warehouse is an authorised reseller of Lenco Trim Tabs. Lenco Trim Tabs make your boat ride smoother, drier, faster and with increased safety, whether on a small runabout or a mega-yacht. 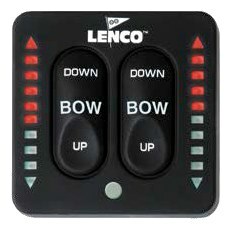 Lenco's ballscrew design is more reliable, three times more powerful than standard hydraulic trim tabs, and provide an instant response. They are oil-free and therefore kind to the environment. These factors combine to make Lenco Trim Tabs the most user-friendly out there. Trim tabs operate independently of one another to provide optimal performance by redirecting water flow at the transom of the boat. 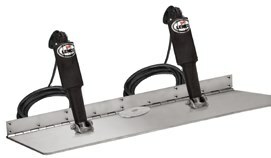 Lenco Trim Tabs have been designed to improve the overall attitude of a boat. If used properly, Lenco Trim Tabs improve the ride, reduce drag, increase speed and improve the fuel efficiency of your boat. The operation of Trim Tabs is basic. The two stainless steel planes are mounted with the actuators on the transom of the boat. When the tabs are lowered, the water flow is redirected creating an upward force at the stern of the boat. When the stern rises, the bow will lower. 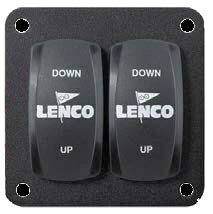 Since Lenco actuators are electromechanical, they provide an immediate response at the touch of the switch. 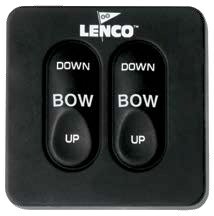 This applies to all Lenco trim tab switch kits. 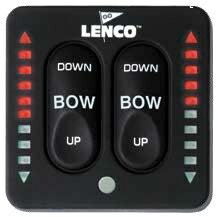 Lenco switches are based on the position of the bow. The left side of the switch controls the port tab. The right side of the switch controls the starboard tab. The system is set up this way to minimize the guesswork while underway. safety of your boat. When making adjustments with the trim tabs, use short momentary taps of the switch. To become knowledgeable on how your boat performs with trim tabs, remember, practice makes perfect. Selecting the right trim tab setup for your boat is largely determined by the boat's length and the available space on the transom. 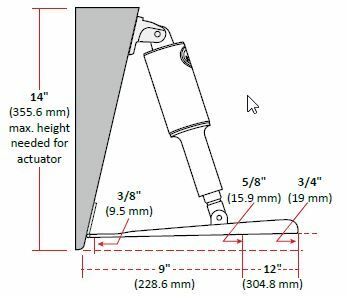 See the guide below for more specific information on Standard and Heavy Duty trim tab kits to help you make your selection. Identify suitable installation locations for the trim tabs. 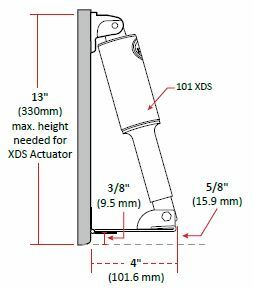 Various kits are available to allow you to fit the actuator into difficult situations, such as behind ladders or under swimming platforms. See below. 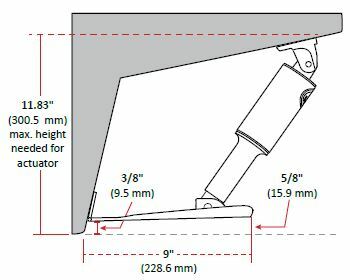 Measure the height of the transom at the installation location. If you need any assistance to choose the correct trim tab kit for your boat please contact our friendly sales team. Perfect for boats with a standard or high transom. Plates are 12 gauge (2.7mm) 304G stainless steel with a 5/8" flared trailing edge and 1/8" diameter hinge pin. 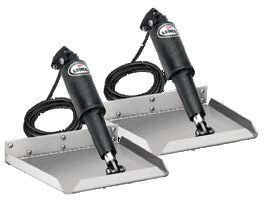 Ideal for boats with a low transom, edge mount trim tabs require a maximum height of only 11". Plates are 12 gauge (2.7mm) 304G stainless steel with 1" turned up edges and 5 degree taper on both sides to the trailing edge. 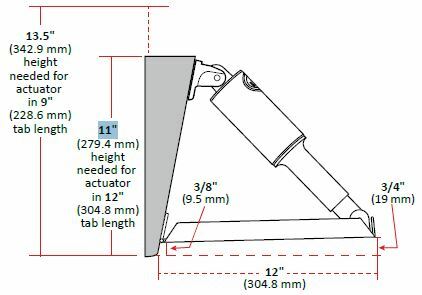 Engineered to fit behind ladders, this unique design gives you the benefits of a standard trim tab in an ultra-compact design. 122 Carling double rocker switch. Plug & play Deutsch connectors. 36" power lead and mounting hardware. Does not require control box. Waterproof key pad and solid state control box with waterproof plug & play Deutsch connectors. 36" power lead for control box. LED indicator displays the exact position of your trim tabs. Auto brightness adjusting. Waterproof key pad and solid state control box with waterproof plug and play Deutsch connectors. Backlit. Note - this switch suits the Super Strong Trim Tab Kit with dual actuators.